Solar-One® batteries feature a design that's so unique, it's patented. Engineers at EnerSys® teamed up with DuPont chemists to design a flooded battery that's so dependable, it's backed by the longest standard warranty in the Renewable Energy industry (7 year free replacement + 3 year prorated). Solar-One batteries with HuP technology ensures that you receive more deep cycles, over its longer life, and a higher capacity for sustained performance during each cycle. HuP® technology offers a battery plate that virtually eliminates flaking and shedding of positive plate materials. Flaking and shedding are the primary reasons for battery failure. They added Tetrafluoroethylene, or Teflon® (DuPont registered trademark for PTFE resins) to the lead paste used in active material of the positive plate. The Teflon forms fibers, and these fibers create a complex matrix that traps and binds the active material together. The material is then locked into place during a controlled curing process. The result, shedding and flaking are virtually eliminated, the lead paste remains cohesive, and contact with the positive grid remains in place longer than in standard batteries. Solar-One® uses a computerized casting which results in less flash and better crystallization during the grid molding process. The advantage is stronger, thicker positive grids that are less susceptible to corrosion. The Solar-One positive grid is the heaviest in the industry. The Solar-One grid design allows for the maximum amount of active material in each plate. This allows for greater utilization of the active material for a stronger, more consistent performance and increased capacity. Solar-One's exclusive 5-layer wrap is a process of horizontal and vertical plate wrapping which provides additional protection against shedding of the positive active material. The negative plate is designed with a staggered grid pattern. A perfect match for the heaviest positive plate, the staggered grid provides for the greatest amount of active material. The Design Advantages Are Built-Into every Solar-One®! Solar-One® batteries by nature are very heavy and present special issues for the Renewable Energy installer. To put this superior technology to work for you, employees at EnerSys designed an epoxy coated steel case that allow each 2 volt cell to be removed. This solved the weight issue and also offers excellent protection against breakage while in shipment. Oversized lead terminals are welded to the battery posts allowing the use of lead coated solid copper buss bars as the cell interconnects. 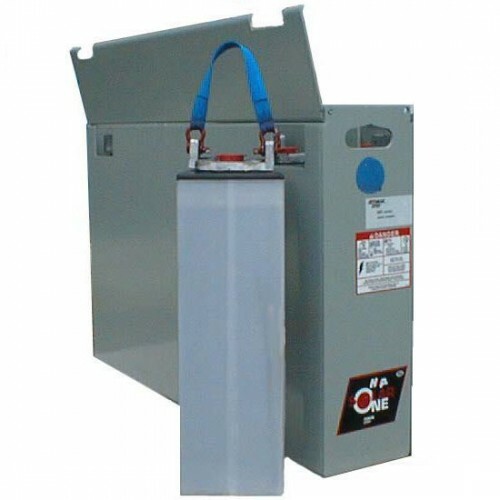 Because the lead terminals are so large and heavy duty, they provide outstanding conductivity and a strong connection point for the cell lifting strap. All these features mean fast and easy on-site assembly, great energy transfer, and the ability to remove and replace individual 2 volt cells. NOTE: Order two for a 24V bank and 4 for a 48V bank. Free shipping applies to all commercial loading docks or locations with a forklift.